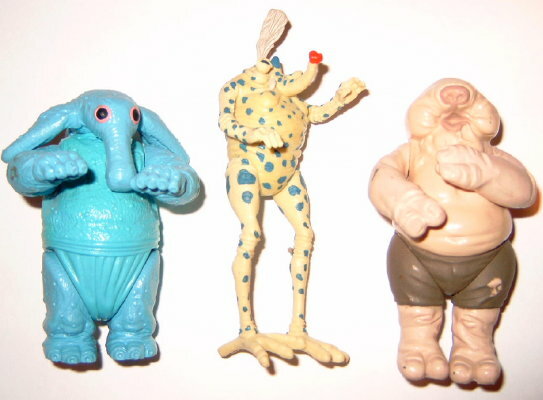 At first glance the three figures seen above from the Max Rebo Band set appear to be production figures; upon closer examination it becomes apparent they're protomolded pieces (or internal first shots) cast out of different plastic colors than their production versions, have hand painted details using a thicker more fragle paint and lack the copyright date and peg holes found on their production counterparts. 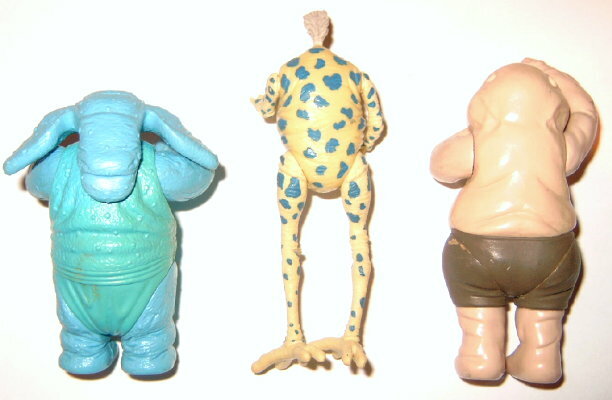 While most protomolded pieces from this period were case from white colored hard plastic for the torsos and white rubbery material for the limbs, this set is rather interesting as they are cast out of their respective colors: the Max Rebo in a dark blue, the Droopy McCool in a shiny plastic similar in color to the production version and the Sy Snootles with a hard yellow plastic for the torso and a light yellow rubbery material for the limbs and head. The rubbery limb material on the Sy has a number of air holes in it. The torsos are glued together and sanded down; production versions used sonic-welding (high frequency sound waves to melt the plastic sections together). I had the privilege of talking with the original Kenner engineer who remembered casting these figures in the basement of the Kenner building in Cincinnati over twenty years ago; he even remembered casting them out of plastics similar to the colors the production figures would be in rather than the usual white-colored material used on other protomolded pieces. Similar to some protomolded pieces from the Jedi era, the limbs are not detachable except for the head on Max Rebo which attaches with a plastic pin. Like all protomolded pieces, these were cast from aluminum metal molds at Kenner. 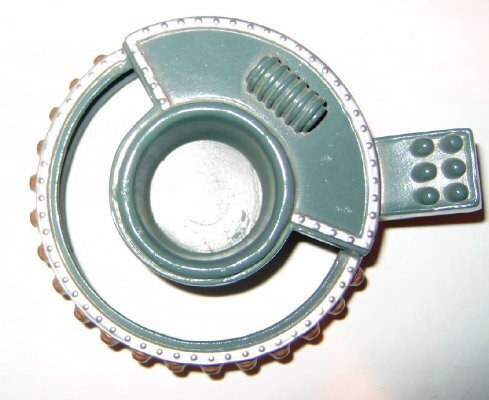 The peg holes and copyright dates were not added until the production-quality molds were produced. Protomolded pieces were likely used as photo samples for photography; the eyes on the Sy are black rather than the blue used on the production version (and this difference is noticable on the Rebo Band packaging). While very, very close to the figures seen on the Rebo Band packaging and in Kenner catalogs, the hand painted spots on Sy are slightly different but match up *very* close. The Max Rebo piano was also included with this set; though its missing the bottom portion and the piano keys, the piano is entirely hand assembled and painted. The buttons and knobs are very rough in detail; the piece is made entirely from light-weight styrene plastic, glued together and lightly sanded. Unpainted versions of Sy and Droopy have turned up, but to my knowledge this is the only complete painted set to turn up.